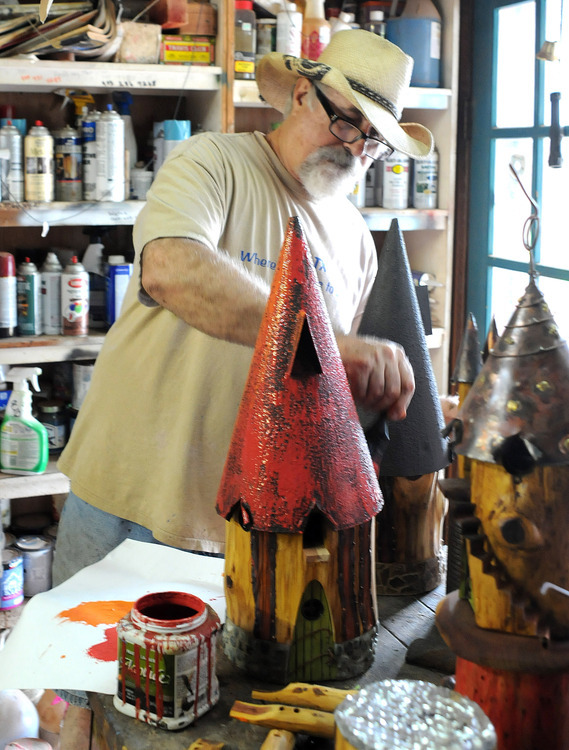 Allow your imagination to run wild for a few moments and if you have ever wanted a birdhouse that was unique, one that conjured up visions of gremlins, hobbits and gnomes, then you’ll find your visit to the small East Texas art community of Edom a total success. It’s a one-traffic-signal, two-restaurant-community just an hour east of Dallas and when you spot the traffic light, park your car. 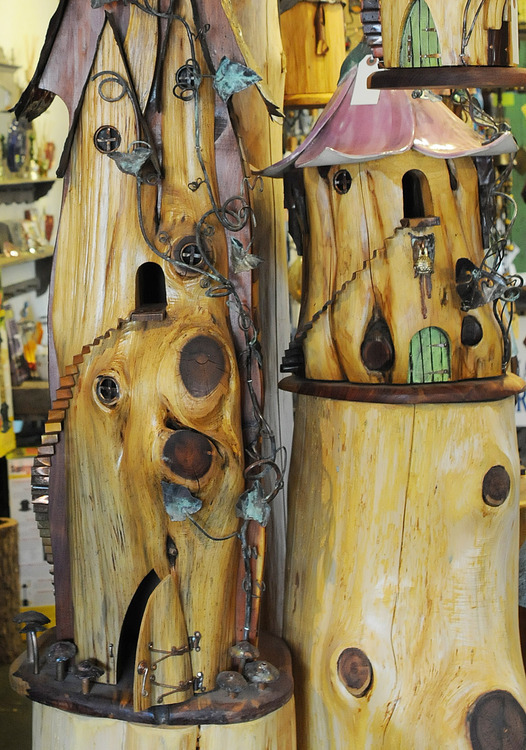 Your adventure begins as you walk into a tiny shop, Arbor Castle Birdhouses. 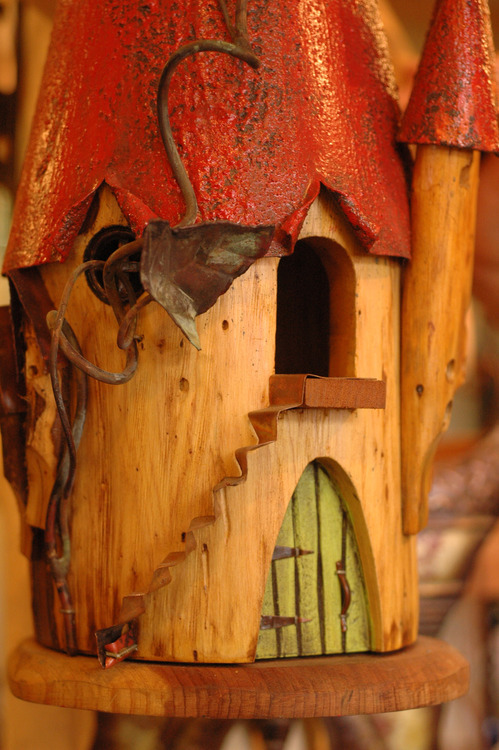 You’ll come face to face with a small mountain of classically designed and very colorful birdhouses that bring to mind numerous fairy tales from your childhood. 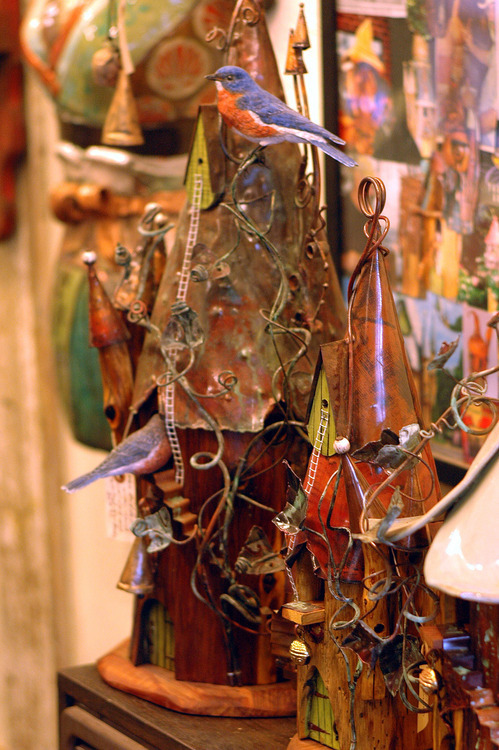 But what you’re looking at isn’t strictly for the birds… but is also for bird lovers who simply enjoy wildly creative art that does more than just stir the mind and raise the eyebrows. 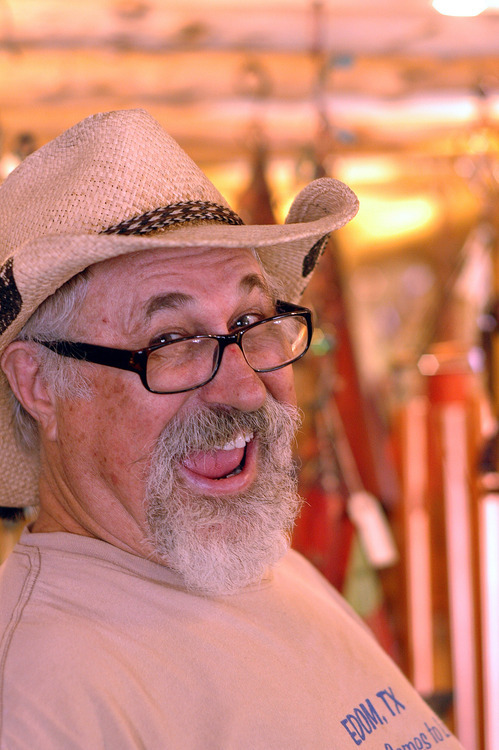 They aren’t cheap… they start at $200 and they sell like pancakes at a church breakfast. 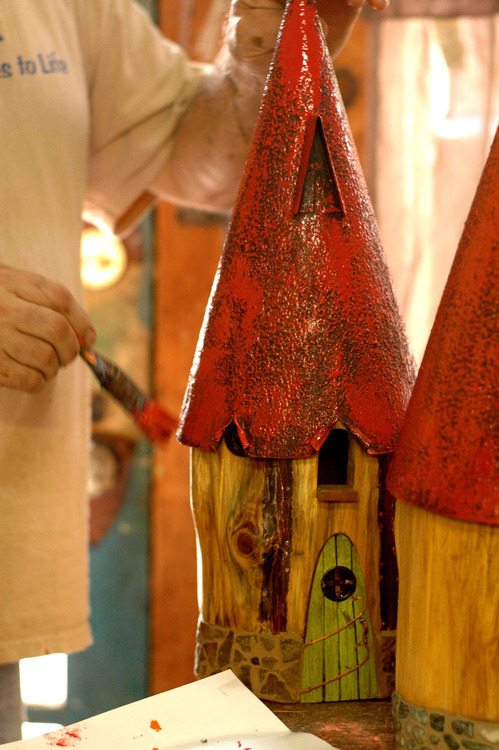 On the day we visited, Joseph mixed a little orange with some red paint and his hands deftly painted the cone-shaped roof he’s just fitted on the main body of a birdhouse. 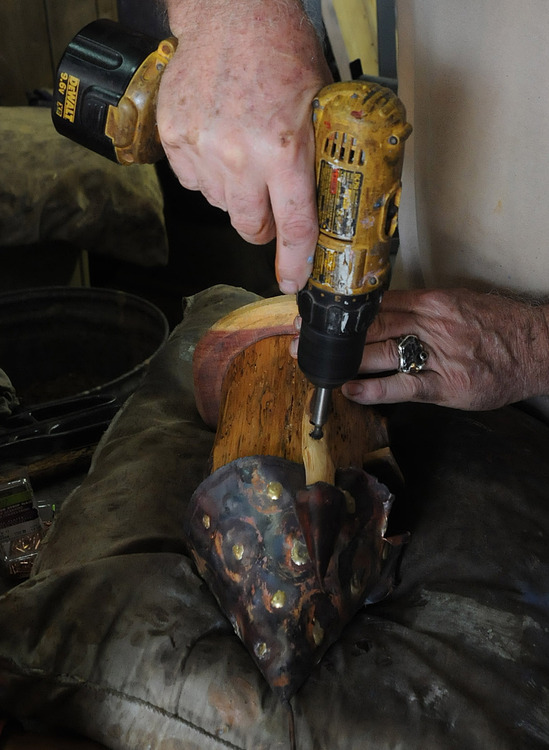 That morning’s work was lined up on a table, along with nails, screws, a hammer and other needed tools and supplies. 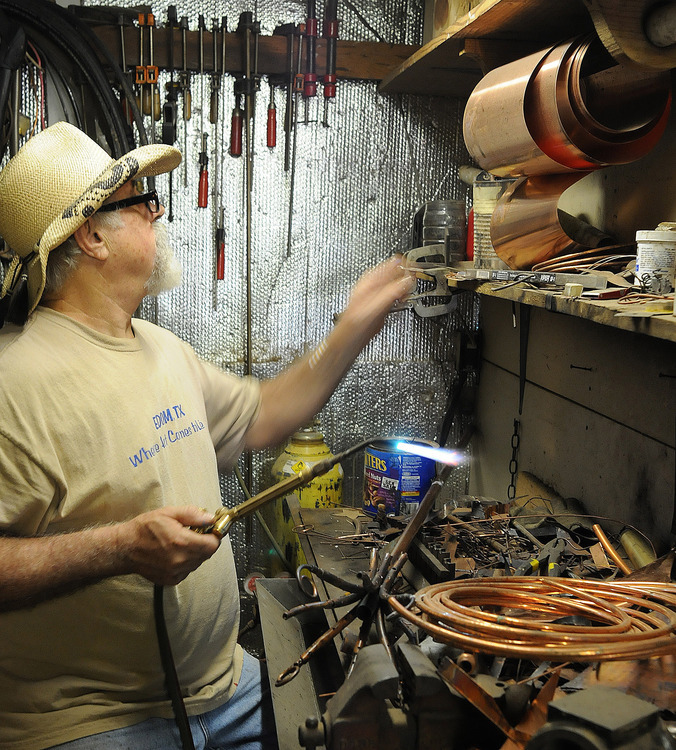 Not all their work is for sale, though that would be a small percentage of what they create. 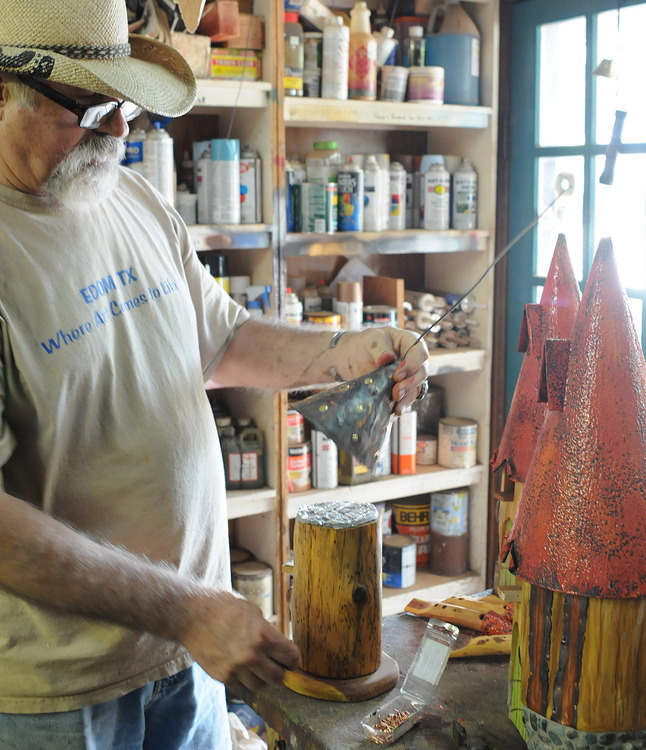 It turns out, the Hopps duo enjoy some of their art so much they get attached to it as much as their customers. So they’ve learned to take particular pieces home with them. 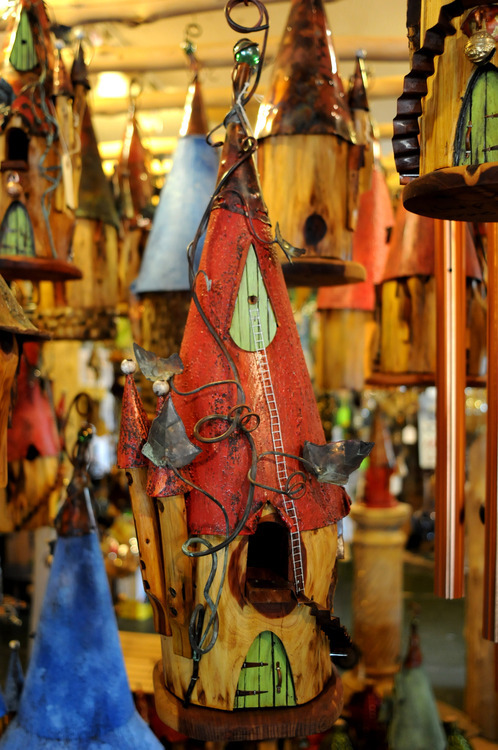 But thanks to the Internet and their taking part in various craft shows, the general public has opportunities to obtain their popular birdhouses just about anywhere in the world. 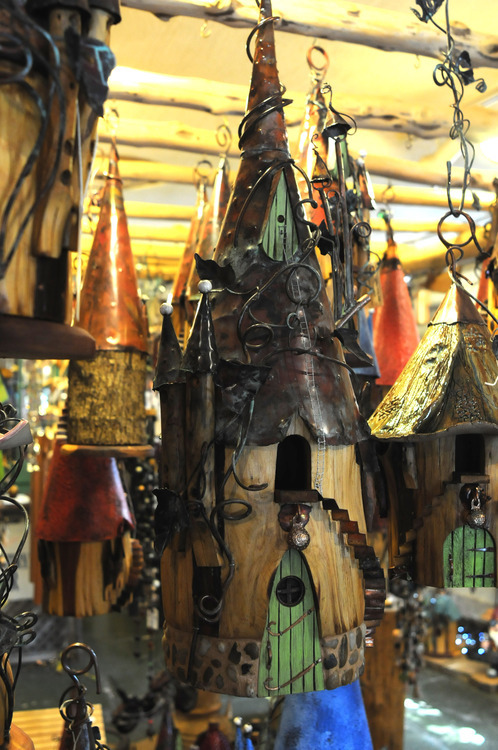 Most of the birdhouses look like a mixture of medieval castles and they are in demand. 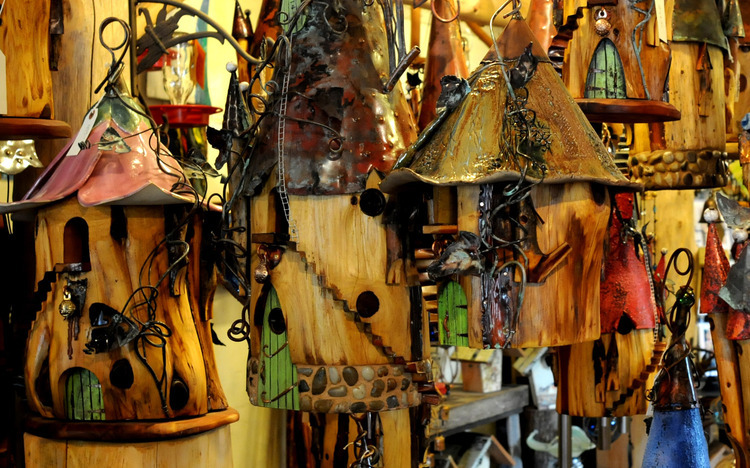 They are unique and they are meant to be used as birdhouses, not just decorations. The doors work, the windows are windows and the staircases are hand-crafted. 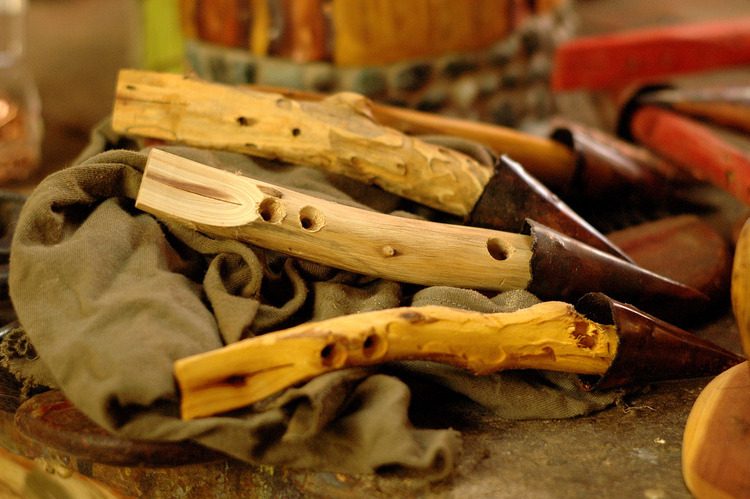 And to think it all started when the artistically inclined elder Hopps was handed a piece of hollow firewood that he thought he might be able to turn into something else. “That’s pretty much what got me started,” he grinned. 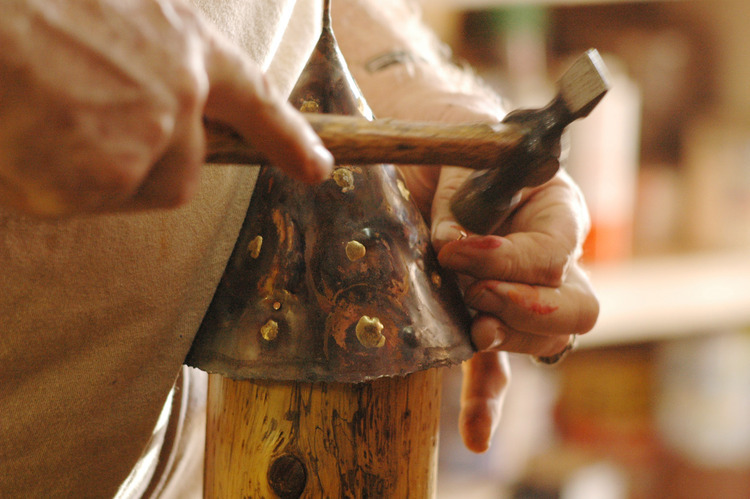 “Anything that is hollow provides sanctuary for a bird,” and thus he began to hurry the hollowing process, not always waiting for nature to provide it. 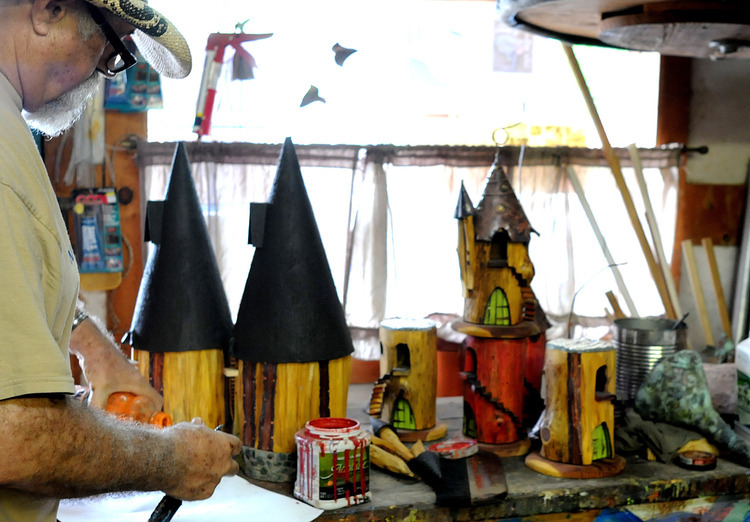 Their creations have cone shaped roofs made of metal, ceramic roofs that look like petals and even some made from gourds. 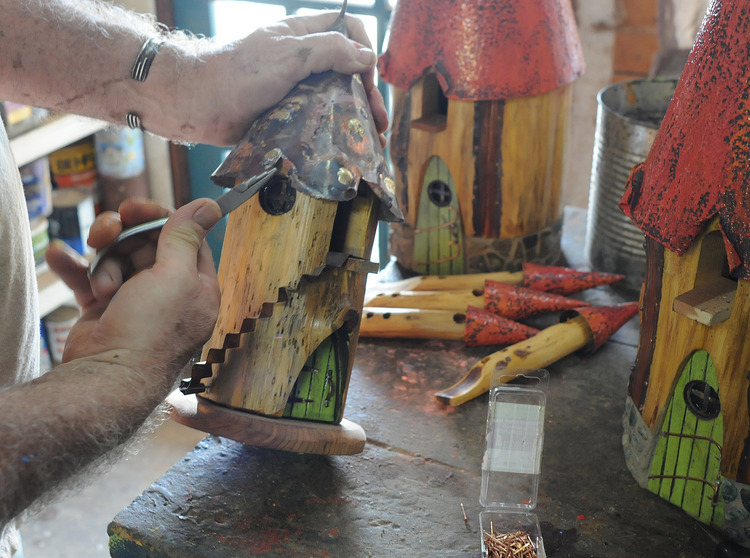 Each is truly a work of art that can function outdoors in all kinds of weather and, Bobby Hopps says, they are all easy to clean each season as owners prepare for their next generation of feathered friends. 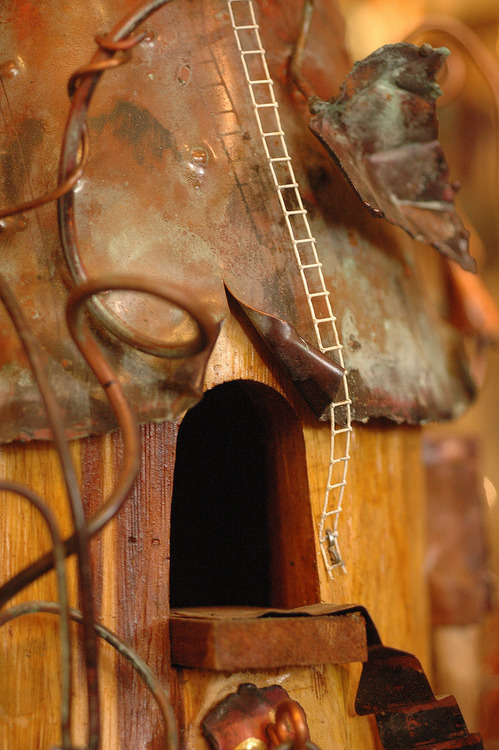 You can learn more about the birdhouses at arborcastlebirdhouses.com.